Beautiful square card measuring 125x125mm when folded in black double sided Pearlescent card. 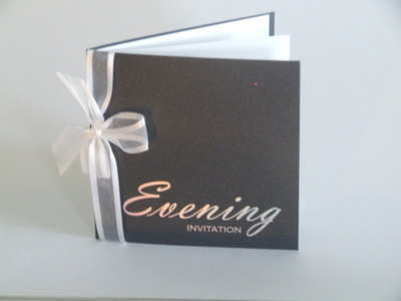 with Silver Holographic foiled words 'Evening Invitation' Use insert LSE to line your card. Free insert layout templates are avaliable to help you with your wording. Select from our matching range of Wedding Invitation, Order of Service, Place cards Thank you cards to match.